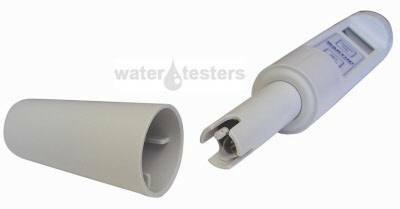 Waterproof pocket testers are designed for all applications. The IP67 Waterproof casing and double junction replaceable electrode make them suitable also for heavy duty applications, such as Waste Water treatment and Agriculture. The modular design allows easy electrode and battery replacement. They have a stability indicator and hold function that freezes the display for easy and accurate recording. The large display also has graphic symbols to guide you through all operations. Complete with a temperature probe for faster and more precise temperature measurement they compensate automatically for temperature. Calibration is made automatically in 1 or 2 points with memorized standard and NIST buffer sets. Auto power OFF saves battery power after non-use. The double-junction electrode can be replaced in a very fast and simple way. PH55 is supplied complete with protective cap, 20ml, pH 4.01 and pH 7.01 sachets of calibration solution, hard carrying case, batteries, and instructions. Range: -2.0 to 16.0 pH / -5.0 to 60.0 degree C.
Resolution: 0.1 pH / 0.1 degree C.
Accuracy at 25 degree C: +/-0.1 pH / +/-0.5 degree C.
Typical EMC Deviation: +/-0.1 pH / +/-0.3 degree C.
Environment: -5 to 50 degree C ; max RH 100 percent. Battery Type: 4 x 1.5V; IEC LR44, A76. Battery Life: approximately 300 hours of use. Measures 38mm diameter by 200mm height. Milwaukee Instruments offers a full line of 7.0 solution for your pH meters and testers.